If you haven't seen Big Hero 6 yet than go and get from your local library. For me it was a spontaneous trip to the cinema with my daughter and the only thing playing at the time was Big Hero 6, it is a brilliant adaptation of a Marvel comic that never really caught on. I have included some of my favourite clips below. So with this activity pack I thought it would be a good idea to put a few activities and ideas together to have a movie day/night where you watch Big Hero 6 and have some fun with it too. To start us off we have some colouring sheets and a how to draw one of the main characters for the older children. Just click on the pictures below for a printer friendly version. How about this super simple Big Hero 6 T-Shirt to sit and watch the film in? these can't be any easier. 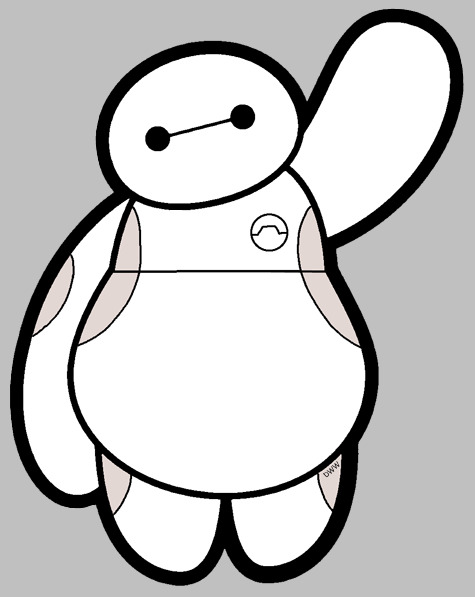 Just click the simple Baymax image for a simple Baymax print. Then buy some cheap white T-shirts from somewhere like Primark and you'll need a Black Fabric pen. Sharpies may work for this but I think a fabric pen would be a better bet. Slide a towel inside the t-shirt to protect the back of the t-shirt. It might be best to do this on an ironing board. Now slide the picture inside the t-shirt and on top of the towel. Now just trace round the image with the fabric pen. Let it dry and job done. You can't have a movie day without snacks so how about some Big Hero 6 snacks? Here we go. Baymax Mallow Pops - These are super simple, just stick a marsh mallow on a stick and decorate each mallow with the simple Baymax face using a black icing pen. Click here for the graphic. Fred's Flamin Hot Candy - Simple just serve some Red Hots (available on Amazon) heres the graphic. Honey's Coconut Chem Balls - Ok so this is a difficult as it gets. If you don't want to do the cooking you can try a coconut mushroom or a coconut teacake from a sweet shop. Here's the graphic. Recipe - These were really delicious. Just melt 4 TBSP of butter in a medium saucepan over low heat. Once it’s melted turn off the heat and add 1/4 carton milk and 1 tsp. of Vanilla extract. Stir it all up and add 2 cups of Confectioners Sugar in 1/2 cup increments stirring each time until smooth (this is where I added the food coloring). Then add in 3 cups of shredded sweetened coconut, mix it to combine and scoop them into ball shapes and place onto parchment lined baking sheet and cool. I put mine in the fridge to help them set. Again this is so simple, just a pack of red balloons and a pack or white balloons. On the white balloons draw the simple Baymax face. Only draw on them after you have inflated them and use a black sharpie. Don't use any metal tipped pens, the balloons will pop. All of the main characters (bar Bay Max) are extremely smart and creative scientists. This will surly mean that our little ones will love to have a go at some wacky crazy science experiments. Here's two of my favourites. 35mm Old style film canister's (I only just barely remember seeing these as a child, so any kids these days are not going to know what these are) I bought mine from Amazon. Alka Seltzer tablets - available almost everywhere but I got mine from Amazon at the same time as the canisters. Open the canister and put in a small amount of water, try one third of the canister. You will need to experiment with how much water you need. I found the less water the better. Crumble up ONE Alka Seltzer Tablet and put it in the canister. Immediately securely put the lid on and turn the canister upside down. Wait 5-10 seconds and Blast Off! Best to do this outside I think. Do this activity outside wearing play clothes. The baggies will explode and make a mess everywhere. Also be sure it’s okay to have paint in the area. Skip the paint if needed. You can also do this one in your bathtub. You might skip the paint there, too. Create little packets of baking soda: add about a tablespoon of baking soda to a square of toilet paper or a small piece of thin paper towel. While the vinegar is in one corner of the baggie, place the baking soda packet in the other corner of the baggie. Try to leave a good amount of air in the bag, and seal the baggie well. Don’t worry if the baking soda and vinegar start to mix right away. Just quickly seal the bag. Shake the bag to mix together the baking soda and vinegar. Watch the bag inflate. It should eventually pop and release the paint. Well thats it for this month, take a look at some of the older Activity Packs I have put together and if you post a picture on my Facebook Page of you and your little ones trying one of the activities then I will send you a great Wayne Wonder T-Shirt. Just click the button below to see my Facebook Page. I list all of my public events there first and you will find out when my next pack is ready to try.